Ø The victim in the case, Mikayil Guliyev, formally withdrew his complaint. On December 28, Narimanov District Court, under judge Turgay Huseynov, held a hearing on the case of Mammad Ibrahim, Deputy Chairman of the Azerbaijan Popular Front Party (APFP). The judge first of all explained the absence of two of the victims. He said that both victims, Oruj Valiyev and Mahammad Gurbanov, had been summoned by the court, but had failed to appear without providing any reason. Lawyer Yalchin Imanov did not object to proceeding with the hearing in the absence of two victims, in order to avoid undue delays to the process. The public prosecutor announced the concluding section of the bill of indictment. According to the prosecutor, Mammad Ibrahim violated the moral standards of the society on Fatalikhan Khoyski Street on September 29 by inflicting a bodily injury on Mikayil Guliyev for no reason, punching Oruj Valiyev and pushing Mahammad Gurbanov. When asked by the judge whether he agreed with the indictment, Mammad Ibrahim said he did not consider himself guilty and that the charges were trumped-up. The court invited Mammad Ibrahim to testify, but he refused to testify at the current stage of the trial. One of the victims, Mikayil Guliyev, testified at the hearing. “I was a member of the APFP. At one of the rallies, I was arrested and fined. The party paid the penalty, which was 80 manat, but Mammad Ibrahim took the money for himself. Mammad Ibrahim sent offensive messages to me via Facebook. On September 29, I met my friends at a cafe near my apartment. We were talking when someone cursed me from behind and punched and kicked me. 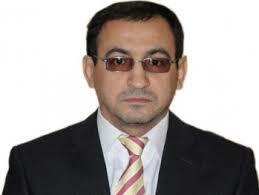 I went to the police and submitted a complaint so that he would be punished,” said Mikayil Guliyev. contrary, the lawyer Yalchin Imanov was warned that he was violating the legal code of ethics and was being disrespectful towards Mikayil Guliyev. At the end, the victim submitted a written application to the court, stating that he had no complaints against Mammad Ibrahim. The hearing was postponed due to the absence of the two other victims. The next hearing will be held on January 11, at 11.00am. Background: Mammad Ibrahim was detained by the police on September 30, 2015, following a complaint made by Mikayil Guliyev. He was taken to Branch #18 of the Narimanov District Police Office, where his statement was taken and he was released. However, he was subsequently picked up again and taken to Narimanov District Police Office, where he was told that he was detained as a suspect. A criminal case has been opened against him under Article 221.1 (hooliganism) of the Criminal Code.